I recently got to see John MacArthur preach here in the Arlington area. His sermons was a condensed version of his "Tale of Two Sons" sermon series, the book of which he was promoting. It was awesome. This man is a Preacher. My wife said it was the best sermon she'd heard in a long time. 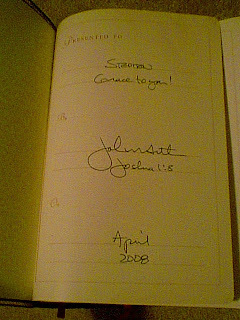 Anyway, the esteemed Dr. MacArthur signed my John MacArthur study Bible (in a way that makes it seem not like a blasphemous autograph in a Bible). Take a look!